The match involving Becky Lynch and Ronda Rousey appears to be off, a review of the Real World Tag League matches, Raw's audience, Jim Ross confirms contract status with AXS TV & more. **We have Monday night’s edition of Rewind-A-Raw up on the site with Wai Ting and I reviewing Raw, the big brawl to end the show, the latest on the Survivor Series and tons of notes from the show. We also reviewed Sunday’s Ring of Honor Global Wars card from Toronto that we attended, went over the news of the day, the latest on Cody, the finish to the Yair Rodriguez vs. Chan Sung Jung fight on Saturday, the death of Stan Lee, and took feedback and questions from the POST Wrestling Forum. **A reminder that every Monday on Rewind-A-Raw, we will be holding a draw to give out a POST Wrestling t-shirt to a member from the POST Wrestling Café. **Tonight, we are back with Rewind-A-SmackDown to review the final show before the Survivor Series and will also preview Sunday’s card from top-to-bottom. On the Double Shot members of the Café, I will be reviewing Ultima Lucha Part 2 from last Wednesday and the opening matches from today’s All Japan Real-World Tag League. Wai Ting will be chatting about this week’s episodes of Being the Elite and Total Divas. **A new episode of the British Wrestling Experience will be out Wednesday afternoon with Benno and Oli Court. Martin Bushby will be joining us Thursday at 3 pm Eastern for the Café Hangout for Double Double, Iced Capp & Espresso members of the POST Wrestling Café. **Our friends that run the WWE Trivia T.O. nights are holding a special trivia night this Wednesday at Tallboys at 838 Bloor Street West in Toronto at 8 pm. They are raising money for the Leukemia and Lymphoma Society of Canada and will be donating $10 for every team that shows up. There will be several prizes for the winning teams, including tickets to Smash Wrestling in town, two copies of “The Comic Book Story of Professional Wrestling” by Aubrey Sitterson, a POST Wrestling t-shirt, and books from ECW Press. **The match between Ronda Rousey and Becky Lynch appears to off this Sunday’s Survivor Series card following the injury Lynch received during the brawl on Raw. 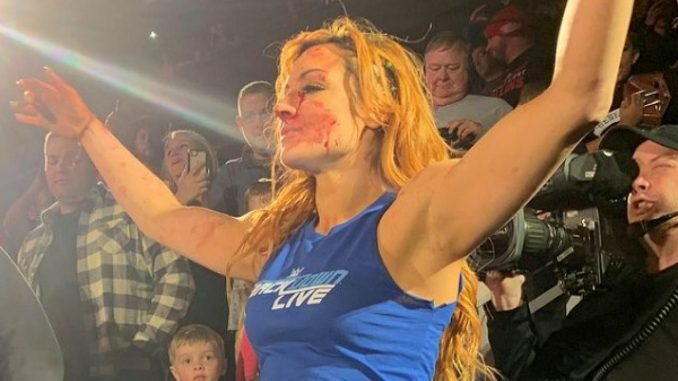 During the segment, Lynch was struck by Nia Jax and was bleeding all over for the duration of the segment. Sean Ross Sapp at Fightful is reporting that the match between Lynch and Ronda Rousey is off this Sunday due to the injury. We reached out on Tuesday and were initially told that Lynch was not cleared for in-ring competition as of Tuesday and it now appears that she will be off the card. We will have the latest on this story on Rewind-A-SmackDown tonight. **The opening hour of Raw averaged 2,761,000 viewers on the USA Network and saw a steady decline throughout the next two hours. The second hour fell to 2,446,000 viewers and then experienced another sizable drop to 2,142,000 viewers for the third hour. The first hour was their highest opening hour since September 17th, however, the third hour was the second lowest of 2018. The Monday Night Football game between the New York Giants and San Francisco 49ers averaged 10,501,000 viewers on ESPN. **Jim Ross confirmed Tuesday that he will be voicing his final episodes of New Japan Pro Wrestling for AXS TV this week. Ross is flying to Los Angeles for the final voiceovers with Josh Barnett, which will run through the end of 2018 when Ross’ deal with AXS expires. Because Ross is under contract to the WWE, he would need the blessing of the company to extend his deal with AXS TV. Ross is under contract with the WWE through the end of March 2019 and then would be free to go wherever he wants. **The WWE has announced that the winners of the ongoing Mixed Match Challenge will receive the 30th entrant’s spot at the Royal Rumble for the men and women’s matches respectively. The current point leaders on the Raw side are Braun Strowman & Ember Moon and Bobby Lashley & Mickie James with six points each while the SmackDown side has a tie with AJ Styles & Charlotte Flair and Asuka & The Miz with six points each. **Mike Johnson at PWinsider.com is reporting that Zelina Vega has been cleared to return and is in St. Louis where the tapings take place tonight. **Due to Joey Ryan’s pectoral injury, he is off this Friday’s Game Changer Wrestling card in Los Angeles. The promotion announced Tuesday that his replacement against Nick Gage will be David Arquette. The card will be airing this Friday night on FITE TV at 10 pm Eastern. **Joey Ryan is still awaiting the results on an MRI to determine how damaged his pectoral muscle is. He stated he had to withdraw from his matches coming up with Game Changer, Northeast Wrestling, and Bar Wrestling. He is scheduled to go to Australia next week for World Series Wrestling, although he’s noted it will likely only be meet-and-greets. **Several media companies, including Sinclair Broadcasting (the parent company to Ring of Honor) have reached a settlement with government regulators over a suit filed by the Justice Department that alleged the companies worked together sharing information to manipulate advertising rates. The terms of the settlement include a seven-year period where the outlets cannot share non-public information. The settlement also includes Tribune Media, Meredith Corporation, Raycom Media, Griffin Communications, and Dreamcatcher Broadcasting. **The WWE stock closed at $67.18 on Tuesday. **MLW has announced a match between Rush and MJF for December 13th in Miami at the Scottish Rite Temple. MLW is running the venue on December 13th and 14th with the shows being taped for their Fusion program. **There is a video interview with former WWE performer Dan Rodimer discussing safety in schools. Rodimer participated on the 2004 season of Tough Enough and was signed to a developmental deal. The company was high on him and were planning to align him with Edge and Randy Orton as the third member of Rated RKO, but it never materialized and was released from the company in 2007. **It was on this date in 2005 that Eddie Guerrero passed away at the age of 38. Guerrero was found in his hotel room by nephew Chavo in Minneapolis and died of acute heart failure. The Raw and SmackDown crews were scheduled to tape television that night before their European tour and the shows were changed to tribute shows in the memory of Guerrero. Physically, Guerrero was breaking down from all the years of wrestling and was a struggle as he was so over as a character. There are a lot of parallels to Brian Pillman, who battled the same issues as he was a hot character that couldn’t perform at the same level he did before the Humvee accident. **Sports Business Journal spoke with UFC president Dana White and revealed that the UFC has struck a new deal with the pay-per-view carriers for 2019. Previously, the company had a roughly 50/50 split of revenue from pay-per-views that they split with the carriers, but the new deal will see the carriers take “closer to 30-percent”, according to White. It demonstrates significant leverage the UFC holds within the pay-per-view space as the only consistent revenue generator with a diminished number of boxing cards airing on pay-per-view and the void left by the WWE after they launched their streaming platform in 2014. It is worth noting in 2017 the WWE’s pay-per-view revenue was still $14.2 million, which was an increase from 2016 that generated $12.6 million, so the company is still doing some business on traditional pay-per-view. White added that in the negotiations for the new distribution deal with ESPN, White was pushing for more events on ESPN’s linear channel and ended with ten UFC Fight Nights on the linear platform. The deal with ESPN goes into effect on January 1st with a $1.5 billion deal with ESPN and ESPN+ over the next five years. **The UFC has confirmed that Robert Whittaker and Kelvin Gastelum will fight for the middleweight title at UFC 234 on February 10th (February 9th in North America) at the Rod Laver Arena in Melbourne, Australia. The two fighters are coaches on the current season of the Ultimate Fighter, which will wrap later this month. Whittaker has won his last nine fights and became the interim champion in July 2017 and later made the undisputed champion of the division. Whittaker is coming off back-to-back decision victories over Yoel Romero in July 2017 and June 2018. Gastelum rebounded from a submission to Chris Weidman in July 2017 and won his next two fights over Michael Bisping and Ronaldo “Jacare” Souza and was selected as the coach opposite Whittaker for TUF. **Saturday’s UFC Fight Night card featuring the excellent main event between Yair Rodriguez and Chan Sung Jung averaged 840,000 viewers on FS 1 for the main card. The preliminary card did 565,000 viewers and the post-fight show did 237,000 viewers. The main card was one of the better Fight Night main cards in terms of viewership in some time. To put it in perspective, the main card of the October 27th card in New Brunswick only averaged 531,000, so the prelims of this weekend’s show with Ashley Yoder and Amanda Cooper did better than the last main card. **James Lynch reports that Louis Smolka has re-signed with the UFC and will be returning as a bantamweight. Smolka was released earlier this year by the UFC after four consecutive losses and has since won three fights outside the UFC. MMA Junkie added that Smolka is slated to fight later this month on November 24th on the UFC card in Beijing, China. Monday’s Raw from Kansas City was the final Raw leading into the Survivor Series featuring a big angle involving the women of SmackDown storming the ring, Brock Lesnar making his first appearance since Crown Jewel, the men’s and women’s teams for Raw are finalized, two attempts at a silly tag team battle royal and Ronda Rousey has no time for millennials.